The number of Transition initiatives in Belgium has trebled in the last two years, and something fascinating is clearly happening there. In some ways, Belgium is the Goldilocks country for Transition, not too big and not too small. I was just there for three days and want to share with you the trip and some reflections on what I saw. Reseau Transition, the Belgian Hub, are doing an amazing job there supporting this growing movement, and it was at their invitation that I boarded the Eurostar and headed over. I arrived on Tuesday evening, met by François-Olivier Devaux from the Hub, we walked to his house, en route passing by, and dropping in on Transistore, a project of the Transition group in his neighbourhood. It’s a shop, created in collaboration with Oxfam and Agricovert, a local producers and consumers food co-operative. As well as being a shop specialising in local and fair trade goods, it also serves as a meeting space for Transition events and meetings. ‘Transistore’. I rather liked that. The next day we headed to Liège, where I had last been 4 years ago. The day started with a meeting at the University, where a group of students and lecturers had got hold of the recent Transition Network publication, A Guide to doing Transition in your University or College. We spent a couple of hours discussing what that might mean for the University in Liège, how they might move it forward, what might be the first steps. We then went to have lunch with some people Ceinture Aliment-Terre Liégeoise (CATL), from the Nourrir Liège festival that was running at the time and of which I was the Patron, and from some of the city’s other Transition-related projects. For example, I heard about Le Val’heureux Liège, the local currency that had just launched when I last came, and seems to be going from strength to strength. It is now accepted in the five regions around the area, and, like the Euro, one side of the notes is common to all 5 regions, and the other side is ‘personalised’, so there are, in effect, 5 versions of each note. They also, rather sweetly, have a zero Val’heureux note, the idea being that it is something to give someone when cash isn’t appropriate but you just want to say thank you and acknowledge their kindness. We spent the afternoon visiting 3 of the 10 co-operatives that have been set up by CATL, the shop Les Petits Producteurs, the vineyard Vin de Liège, and Brasserie Coopérative Liègeoise, a brewery. But I am going to write about those in a separate blog, because I think that the story of what is happening in Liège is so fascinating. You’ll find that here. With Christian Jonet of CATL and Pascal Hennen, manager of Les Petits Producteurs, and the €5 Les Val’Hereux note which features CATL. Once it was all finished, there was a party at Les Petits Producteurs into the early hours to celebrate, lubricated with local beer and homemade pizza. Next morning started with a breakfast with members of the Nourrir Liège team and people from the local government including the Mayor. It was fascinating to hear the level of commitment to and excitement about CATL, and how the idea has become one of the key things in the city that they want to support. Again, there is more about that in my Liège blog. With the excellently-named Willy Demeyer, the Mayor of Liege. Members of Nourrir Liege, CATL and the Liege municipality sharing breakfast. We then travelled to Faulx-Les-Tombes to visit Les Semailles, an amazing business that sells heritage varieties of seeds and keeps rare varieties alive. We were visiting with Carlo di Antonio, the Minister of the Ecological Transition for the Wallonia region who, among other things, has been behind the ban in the region of neonicotinoids in the region as of June 1st. We were shown around the workshop by one of the businesses’ owners, Catherine Andrianne, seeing how the different seeds are processed, preserved and packaged. It was really heartwarming to see an operation. While campaigners and gardeners have succeeded in enabling gardeners to use heritage varieties of seeds, the obstacles that stand in the way of farmers using the remain formidable, although pressure is building to change the situation. Next time I open a packet of seeds I will have a bit more respect for what it took to get those seeds in the envelope! A former running machine which has been repurposed as a slow conveyor belt for sorting out damaged or spoiled seeds. After a delicious shared lunch of soup made with heritage varieties of tomatoes, we headed to Wavre. First, I met with members of Wavre en Transition, who have only been going a couple of years, but who have a real richness of projects underway. They have a community fridge, a community shop to open shortly, an Incredible Edible project, a Repair Café, a film club, a local currency scheme, a zero waste project, plans to build an education centre, and various others – see below. With the good people of Wavre en Transition. We talked about their work, and they asked me questions about how things work in other places too, a fascinating exchange. This was followed by a meeting with people from different foundations and funding bodies about sustaining and financing Reseau Transition, which was a very lovely, and at times moving, celebration of their work and of what’s happening in Belgium right now. Speaking at the funders’ event. From Wavre, we headed to Louvain-la-Neuve, a university close to Brussels, for the evening’s event, a talk with Olivier De Schutter, food academic, campaigner, legal scholar and writer who was the United Nations Special Rapporteur on the right to food from 2008 to 2014, and also appears in the film ‘Demain’. The event sold out weeks ago, selling all 650 tickets in a day, and with over 500 people on a waiting list. The hall was packed, and the evening was chaired by Vincent Wattelet of Reseau Transition. You can watch the video of the whole evening which was streamed live on Facebook here, including the live Q&A which was a lot of fun. I loved the concept, from Olivier’s incisive and powerful presentation, of the ‘Partner State’, what it would look like if the state saw its role as being to support Transition and to remove any obstacles in its way. After the talk lots and lots of people wanted to come up and say hello, so it was quite late when we finally left and were able to get back to Brussels to sleep. Certainly one of the loveliest events and talks I’ve done for a while, the buzz and energy in the room was amazing. The final morning started with an interview, and then we headed across town to the offices of RTBF radio, where Francois-Olivier and myself appeared on their show for just under an hour. You can find that here. One of the presenters had also organised the Facebook live feed the previous night, and so many questions had been sent in that he also used some in the radio show. It was a very charming informal chat, all feeling very relaxed. Next stop was the offices of STIB, the organisation responsible for public transport in Brussels, namely the buses, trams and metro trains. I had been invited to give one of their monthly lunchtime talks to staff, a packed room of people from all levels of the organisation. A whistlestop tour through the imagination, through Transition, and through what it might look like if STIB became a catalyst for Transition in the city. A fascinating question, and one it would be fascinating to see where it leads. Last stop was the offices of Le Soir, one of the biggest newspaper in Belgium, to do an interview, which appeared the next morning in the paper under the heading ‘La croissance économique est une illusion dangereuse qu’il faut remplacer’ (‘Economic growth is a dangerous illusion that must be replaced’). You can read the full piece here. And that was that, I was off to the Eurostar and the long journey home, struggling under the weight of all the bottles of artisan Belgian beers I was given (see the sacrifices I make for this movement?!). I was left with a feeling that something fascinating is stirring in Belgium. Very strong interest in Transition. A high proportion of young people coming to events and present in projects. Some very ambitious Transition groups, and projects, such as that in Liège, making very real impact and starting to change the story that both people and politicians tell about the future of the city. 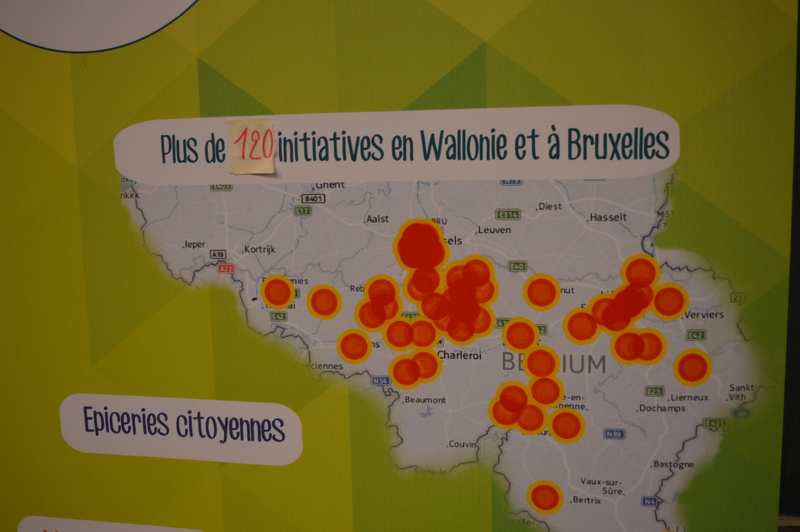 The Wallonie region is large enough to have a real impact, but small enough that change can happen quite fast. This, if you remember, is the region that blocked CETA, the EU trade deal with Canada. As I said at the meeting with funders, it feels to me like something amazing is stirring, something powerful is underway, which is simultaneously dynamic and fragile, and the level of interest, enthusiasm and ambition needs foundations put under it in order that it doesn’t then just collapse. What does that look like? My thanks to the Belgian Hub folks for all their hard work, to my hosts in Liege and Brussels, to Francois-Olivier and his family for their hospitality, to Caroline and to Isabelle. If you feel so inclined, please support the Belgian Hub, their work is amazing, and they need your support. Thanks. Photos courtesy of François-Olivier Devaux and Christophe Smets.